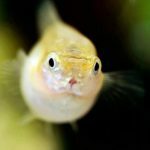 A lot of fish can be compatible tank mates with Guppies such as Corydoras Catfish, Platy Fish, Molly, Tetra and others. There is nothing wrong with keeping a Guppy’s species only aquarium tank. However some owners might want to keep a variety of fishes to create a community aquarium tank with Guppies to create an interesting environment instead. If you only have Guppies in your aquarium tank, it might look a bit bare since Guppies’ swimming level is at the top and middle portion of the tank. So you might find that the bottom of the aquarium tank might look a bit empty. While Guppy is a hardy fish, its large long tail makes it an easy target. And the long tail makes it one of the slower swimmers. When other fish bites a Guppy’s tail, it has a chance that it will develop bacteria or a fungal infection. 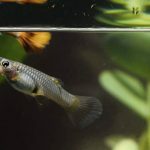 If any parts of a Guppy’s tail are bitten off, it never grows back. 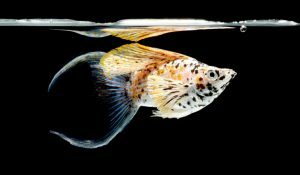 Adding the wrong type of fish that isn’t compatible tank mates with Guppies will no doubt add inevitable stress to your Guppy fish’s health. Just imagine being chased by someone constantly for a bite. So picking the right tank mates with your Guppies is important, as the less stress your fish has, the more likely they are to thrive. 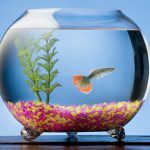 Which Fish are Compatible Tank Mates with Guppies? The typical rule to finding compatible tank mates with Guppies to create a community aquarium tank is to avoid known fin-nibblers, such as Tiger Barbs or Red-Tailed Shark, and fish that grow too big in comparison to Guppies, such as Angelfish. Small and peaceful fish are the best tank mates for Guppies and avoid the ones who will stop for a bite of Guppy’s tail! 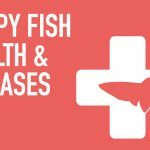 While there are other fish that are not listed, we’ve created a list of fishes that are safe options who are compatible tank mates with Guppies. 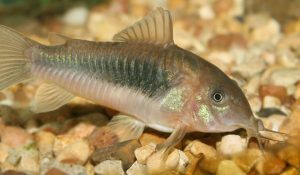 Corydoras Catfish (Cory Catfish) — A type of catfish they are relatively slow swimmers, peaceful cohabitants. They are also great at picking up leftovers in the aquarium tank. 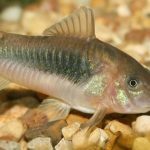 Since Guppies usually swims at the top and the middle column of the aquarium tank, Corydoras Catfish would be a great tank mate with Guppies to occupy the bottom space of your aquarium tank. Dwarf Loaches — All Loaches are very peaceful fishes. 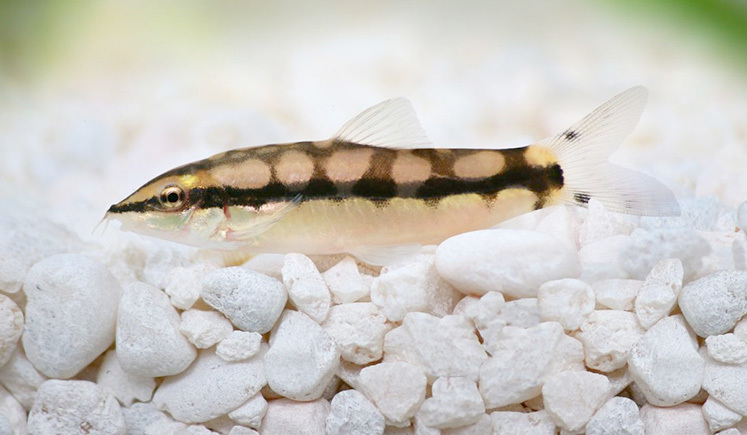 However most Loaches can grow up to be really big in size compared to Guppies. Like their name suggested, Dwarf Loaches stays small and rarely reaches 2″ (5 cm) in length so they’re perfect along with Guppies since they’re similar in size. Be sure to get at least three as they likes to swim in shoals. Try to create some hiding spots and adding some live plants as Loaches likes to hide and rest. Endler’s Livebearer — Many people believe that Endler’s Livebearers are relatives to the common Guppy. Some hobbyists and pet stores might even call them Endler’s Guppy. 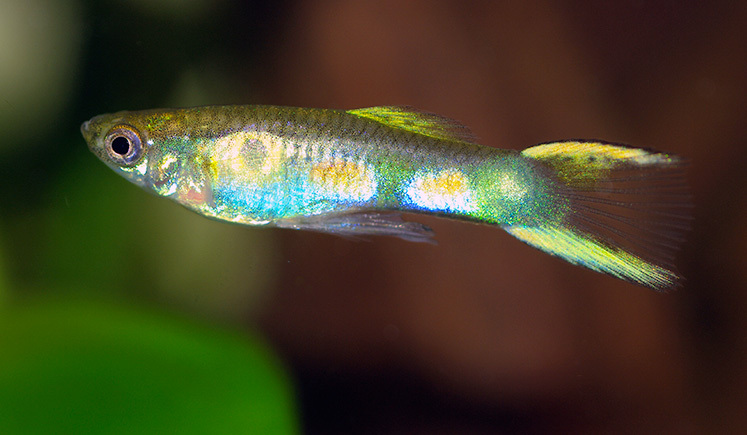 Due to Endler’s similarities with Guppies, they will interbreed if there are males and females placed in the same tank. Endler’s Livebearers also make a great addition to a community tank with other small peaceful fish. 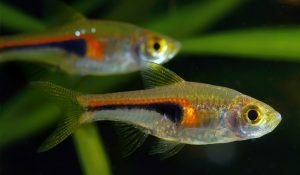 Be careful when adding other fishes with Endler’s Livebearer in the tank since they are really small-sized fish, only growing up to 1.5″ (3.8 cm). Make sure their tank mates aren’t much bigger than them otherwise they’ll be eaten. 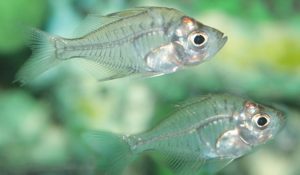 Glass Fish (Indian Glassy Fish / Malaysian Glassy Fish) — Glass Fish are hardy and fairly peaceful, making them good tank mates for Guppies and other small Tropical Fish. They’ll make your tank look unique with its transparent body that reveals their bones and internal organs. Glass Fish are a schooling fish so preferably they are kept in groups of five or more. 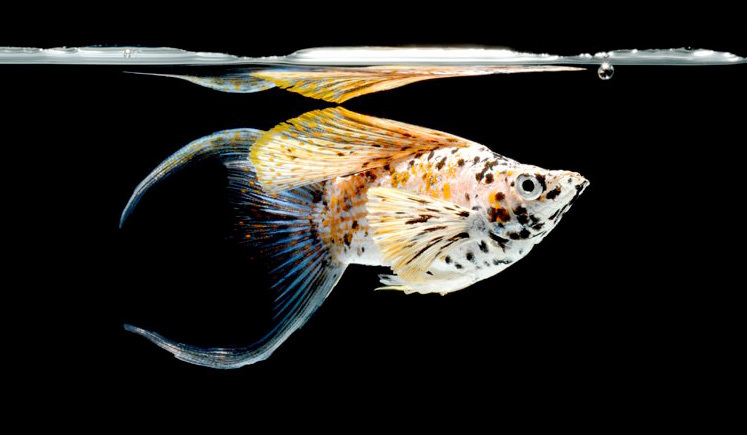 Try to avoid buying the ones who were injected with florescent colored paints to create an artificially colored fish, they are sometimes referred to as “Dyed Glass Fish” or “Painted Glass Fish”. The coloring process stresses them and makes them more susceptible to disease as the needles that were used to inject them with the dye opens up wounds for diseases. Molly — Like Guppies, Mollies are peaceful Livebearer fish. You wont have to worry about your Guppy or Molly fighting with one another, as they co-exist peacefully. Mollies are shoal fish, so be sure to have a couple otherwise they’ll get lonely. 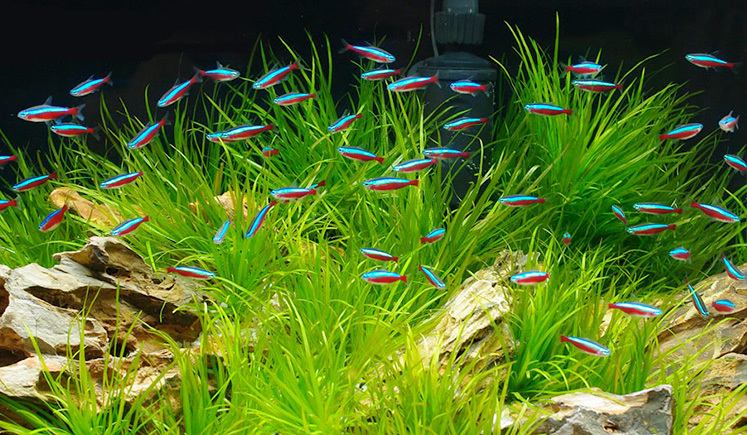 Neon Tetra — Neon Tetra is one of the most popular freshwater tropical fish. They are often described as the jewel of the aquarium. Neon Tetra has iridescent blue and bright red bodies. They can really create an interesting group of fish in your aquarium when kept in schools of six or more. 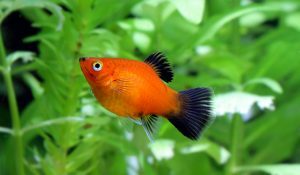 Platyfish (Platy) — Platies are hardy and colorful fish that is a nice addition to a Guppy community aquarium tank. They are also fairly hardy and easy to care for freshwater fish beginners. Rasboras — Rasboras has a metallic coloration and are easy to take care of them. These colorful, hardy fish are best in schooling groups of six or more. Rasboras are small, peaceful schooling fish and will do well in a Guppy community aquarium tanks or with any fish of the same size. You don’t necessarily have to have fish living with Guppies. Adding invertebrates and other small aquatic amphibian can make a more interesting community tank aquarium and makes great compatible tank mates with Guppies. Ghost Shrimp and Red Cherry Shrimp adds the benefits of being excellent tank cleaners! 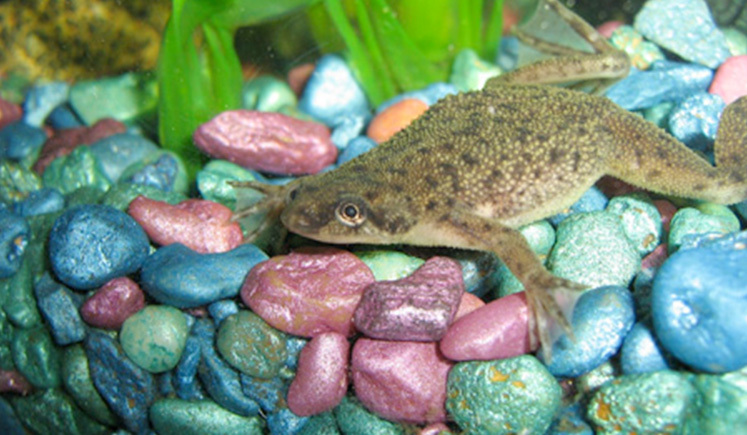 African Dwarf Frogs — African Dwarf Frogs are fairly compatible tank mates for almost all tropical community fish aquarium. As their name indicates, they are dwarf-sized so will be great with smaller sized fishes like Guppies. They are fairly shy so be sure to create an aquarium space that allows them to hide. You might have to make sure they get their share of food though since they’re fairly slow swimmers in comparison to Guppies. 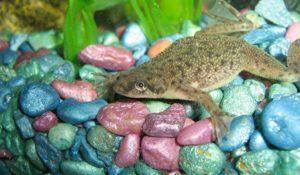 Be sure to get at least 2 as African Dwarf Frogs are social. 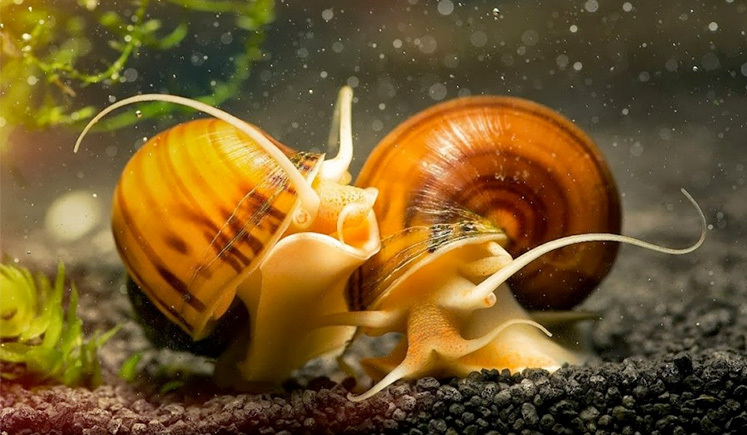 Apple Snail — Easy to care for and generally does well in a common aquarium. 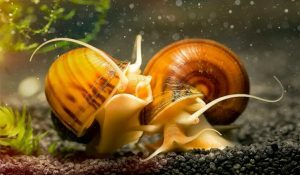 Apple Snails can live together with most fish species and they can be used to keep the aquarium clean of algae. However be careful with keeping them in a small tank since they can cause problems with the water quality. Also make sure you have a tank cover on otherwise you might find it outside of the tank! 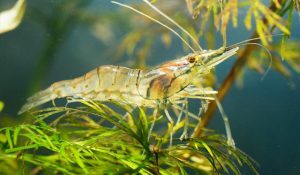 Ghost Shrimp (Grass Shrimp / Glass Shrimp) — Ghost Shrimps are great tank mates with Guppies and as scavenger they can help clean your tank with any leftovers. They are relatively inexpensive since they are usually used as feeders for larger-sized fish but can be fun to watch if added to your community aquarium tank. They are generally very acceptance of any hardy addition to any aquarium, definitely recommended for your community. Red Cherry Shrimp — Red Cherry Shrimp is another great shrimp tank mate with Guppies because they can help clean the tank by eating some of the algae off rocks, ornaments, gravel, and etc. If your Red Cherry Shrimp are small enough, Guppies and/or other fish might even try to eat them. Add some live plants along with it to your aquarium tank so the Red Cherry Shrimp so they can use it as shelter and hide. 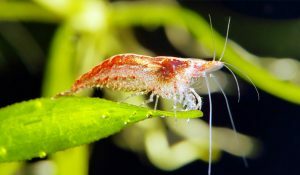 Red Cherry Shrimps are sometimes white in appearance and don’t fully turn red until they have adjusted to their new environment. But be careful, Red Cherry Shrimp breeds just as easily as Guppies do! Similar Temperament and Behavior of Fishes — Do not get any fish that are fin-nibblers because male Guppies generally have very large fins. Guppies are fairly peaceful fish so adding aggressive species will no doubt add unnecessary stress to their health. Diet & Water Requirements — Make sure to choose only fish that require the same diet and water conditions as your Guppies. Be sure to check the pH requirements of any species you want to add. 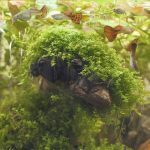 Aquarium Tank Size — Make sure you have adequate room to house all the fish in your aquarium tank. The general rule is to have one inch of fish per gallon of water. Similar Size of Fish — Guppies are a fairly small-sized fish so it’s best to stick with small fishes, as larger-sized fish will sometimes attack or even eat the Guppies as a snack! Some larger-sized fish might become really aggressive during feeding time and the smaller-sized fish won’t be able to eat their share of food. Aquarium Tank Region Preferences — Bottom feeder fishes or invertebrates can live well with Guppies. It also creates a more filled up looking community fish aquarium tank since Guppies usually swims in the top and sometimes middle portion of the tank. The bottom part of your tank will look bare.